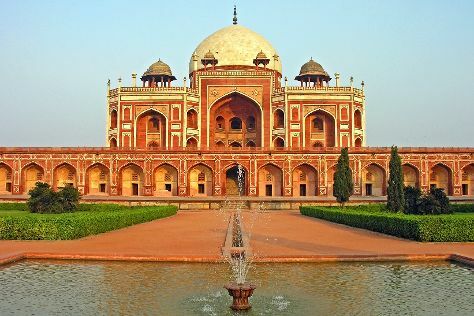 Start off your visit on the 13th (Mon): admire the masterpieces at Crafts Museum, admire the natural beauty at Humayun's Tomb, then contemplate the long history of India Gate, and finally contemplate the long history of Gurudwara Bangla Sahib. On the 14th (Tue), you'll have a packed day of sightseeing: stroll through Akshardham, then see the interesting displays at National Museum, and then see the interesting displays at Gandhi Smriti. For ratings, photos, where to stay, and other tourist information, you can read our New Delhi trip tool . Use the Route module to find suitable travel options from your home destination to New Delhi. May in New Delhi sees daily highs of 47°C and lows of 30°C at night. Finish your sightseeing early on the 14th (Tue) so you can travel to Dalhousie. Start off your visit on the 15th (Wed): hike along Ganji Pahari, then take your sightseeing to a higher altitude at Dainkund Peak, and then pause for some serene contemplation at St. John's Church. To find maps, other places to visit, photos, and more tourist information, you can read our Dalhousie trip itinerary planner. Do a combination of flight and taxi from New Delhi to Dalhousie in 5 hours. Alternatively, you can drive; or do a combination of train and taxi. Finish up your sightseeing early on the 15th (Wed) so you can travel to Khajjiar. Start off your visit on the 16th (Thu): look for all kinds of wild species at Kalatop Wildlife Sanctuary, contemplate the waterfront views at Khajjiar Lake, and then contemplate in the serene atmosphere at Khajji Nag Temple. To see other places to visit, more things to do, maps, and tourist information, you can read our Khajjiar trip website . You can drive from Dalhousie to Khajjiar in 1.5 hours. Wrap up your sightseeing by early afternoon on the 17th (Fri) to allow time for travel back home.